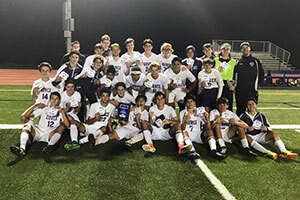 The Warwick Valley High School Boys Varsity Soccer team won the 2017 Section IX Soccer Tournament with a thrilling 1-0 overtime win over Monroe-Woodbury. 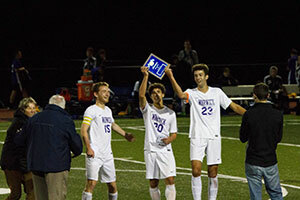 Eric Ormsby received a pass from Sam LaTorre with 3 minutes to go in overtime and blasted a shot past the Monroe goalkeeper. It was Ormsby’s team leading 19th goal of the season. 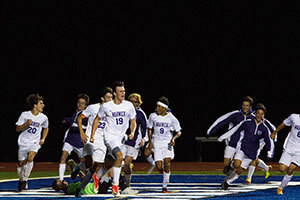 T he boys improved to 16-2 and are the 6th ranked team in New York State AA Soccer. Rob Sheridan made ten saves in goal – including a couple of spectacular ones – to preserve the shutout for the Wildcats. UPDATED GAME TIME – Warwick plays Section 1 Yorktown on Thursday, Nov. 2 at 8 pm at Middletown High School in the first round of the State Tournament.